I shall post the Abstract, followed by the original post. I hope to have some collaborate and review my work in time. This entry follows on from my fractal growth and development entries - published earlier. There is never one snowflake alike, but there are snowflakes. The fractal offers insights and helps us understand growth and development, change and evolution, then it should also help us understand sustainability. It should clarify what sustainability is. Is it real? Is it possible? Is it an illusion, or is it a delusion? Fractals, by definition are patterns that show: 'same' but 'different', or regular irregularity - at all scales. Fractals do support sustainability in one way; but not in another or the way 'we' currently associate sustainability with, the notion of keeping the environment or the economy today without compromising future generations. It maybe that the notion of sustainability is a (mathematically) non-sense. Here's why. To see why sustainability is a false statement - and doesn't hold - at least in the way it is commonly used - we need to split the above definition to the 'same' and the 'different'. The 'same' or the 'regular' part of the fractal definition suggests that patterns, rules, and knowledge all repeat, at all scales: this part is sustainable or constant, it will happen, it does happen. This feature of fractals is explained by strange attractors found in the study of chaos and fractals; the repeating of a rule. An example of the 'same' component - what I term lines of fractility - is exposed within the study of biology with 'evolutionary convergence' or 'analogous structures' - as shown in example diagram below. 'Same' pattern - a wing, but 'different' forms (Bat, Bird, and Insect). The line of fractility is clearly flight by wing, and this is a repeating pattern, repeating at all scales. Today, we could add to this (at least) the human developed aircraft wing . The 'different' or 'irregular' part of the definition alludes to change, roughness or variety, it alludes to evolution: this component part of the fractal definition is not a sustainable, or fixed notion. This is where sustainability is a nonsense. Fractals show us how there will never be a repeat of anything again: there isn't, or has never been, another snowflake the same; there will also never be another 'me', or another 'you'; there will never be another repeated moment. Things come and go, for a complexity of reasons. As objects (species) evolve, so to will they become extinct, whether we like it, or not; but rules or functions the 'same') will not (not to suggest they can't, else I will be breaking the laws of fractility). 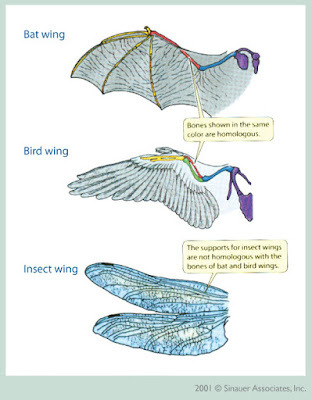 In the wing diagram example; we see that there are many different variates of wing, at least Bat, Bird and Insect; but there is more to this than just that: the 'different' suggests a superposition all the wings that have ever been, and will ever be. Patterns repeat, there will again be winged flight, it is a part of 'life'. It is with this I suggest that the fractal shows us that the political notion of sustainability is a nonsense. The thought that humans, for whatever (moral) reason, can hold the likes of life, development, or an economy constant forever, when 'scientific' observation and knowledge shows us evidence only to the contrary, is a nonsense. As an after thought: it is as if this part of the definition (different) is a flow concept - the coming and going of something: the other 'same' or 'function' part maybe a stock, or standing (wave) concept.